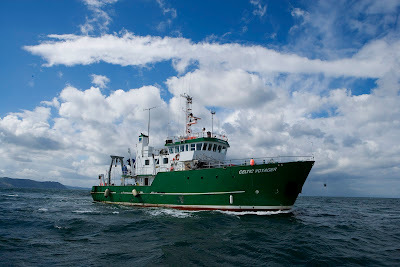 Would you like to win a trip on-board Ireland iconic marine research vessel, The Celtic Voyager? Galway Mayo Institute of Technology (GMIT) have teamed up with the Marine Institute to offer ten Transition Year students the chance of a lifetime - a unique opportunity to conduct scientific research on-board the Celtic Voyager in Galway Bay on Sunday October 7th. The lucky winners will leave from the docks in Galway for a marine survey centred on the core disciplines of Benthic Ecology, Fisheries Biology, Marine Geophysics and Oceanography. The expedition will be led by experienced scientific personnel from the Strategic Marine Alliance for Research and Training (SMART - maybe the best acronym ever?) and Galway-Mayo Institute of Technology. The students will use the state of the art equipment on-board the sophisticated vessel working alongside scientists to investigate physical, chemical and biological aspects of Galway Bay and learning about potential careers in marine science and technology along the way. So, what do you have to do to get a place on-board? Well, essentially it's a photo and caption competition. To apply send a photograph which captures the theme "Water, Our Greatest Resource" and a 200 word description to the GMIT Schools Liaison Office Facebook Page. Make sure to include you name, your School, a contact email, your 200 word description and, of course, your photo! The closing date for entry is the 21st of September 2012 so get snapping!!!! One more thing - make sure to get permission from your parents and TY Co-ordinator before entering and good luck!